*The following post was pre-written to accommodate the fact the Rider Prophet is currently in Las Vegas and likely in no condition to operate a computing device. Barring any legal complications the Rider Prophet will be back from his vacation and resume regular posting on Monday. As you’ve seen throughout our ongoing salute, there are bad team names in virtually every sport, at every level and in every league. But when I came across the subject of today’s salute, I knew that they were in a league of their own when it came to bad team names. - Rain or Shine Elpaso Painters – was the Rain or Shine part really necessary? And besides who the hell paints in the rain?! - Purefoods Tender Juicy Giants – As terrible a name as Tender Juicy Giants is, it’s actually a remarkable improvement over their previous team name… the Corned Beef Cowboys. 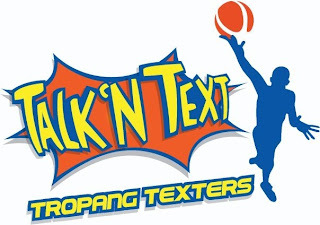 the mighty Talk N’ Text Tropang Texters who are the reigning Philippine Cup Champions. When the best team in your league is called the Texters you deserve to be the laughingstock of the professional sporting world. So congratulations PBA for giving the sporting world so many bad team names that you warranted your own post.